If you use the iTunes Store, or any other Apple online service such as iCloud, you have an Apple ID. This is the email address associated with your Apple account. I get lots of questions about Apple IDs, and in this week’s column I answer a number of them. Q: My Apple ID is an email address that I used to use but that I recently changed. I won’t be getting email from it anymore, so I need to change it. How can I do this? There are two types of Apple IDs, and the flexibility they give you depends on the type. The first is an Apple ID based on an Apple email address, such as @icloud.com, @me.com, or @mac.com. If your Apple ID uses this type of address, you can’t change it. You can change the name or (non-Apple) email address associated with your Apple ID from this page. You can change the email for an Apple ID if it uses any other kind of address, such as one with an @yahoo.com or @gmail.com domain. Go to Apple’s My Apple ID page and click the Manage your Apple ID button. Enter your email address and password, then click Sign in. From this page, you can change your name (if you’ve gotten married, say) or your email address. 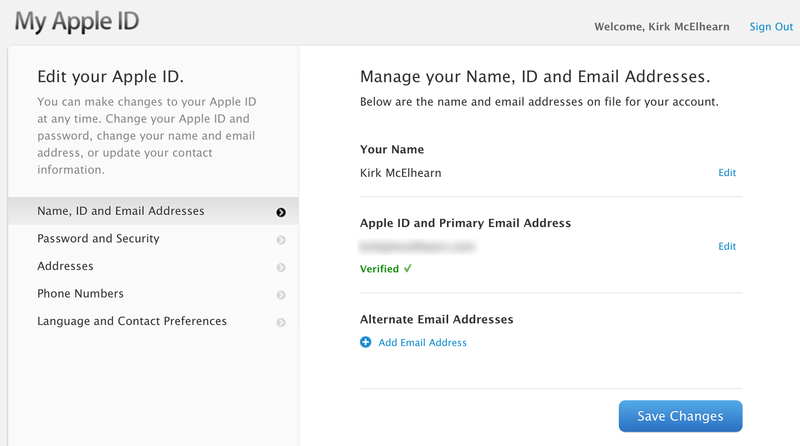 The My Apple ID page also lets you change your password, address, phone number, and more. You can even add an alternate email address. And if you have an Apple ID based on one of Apple’s addresses, you can already use three different versions—yourname@icloud.com, yourname@me.com and yourname@mac.com—to access your Apple accounts. Q: I recently moved to Australia from the United Kingdom, and have an iTunes account with the UK store. I also want to establish an account with the Australian store so that I can use Australia-only apps and redeem Australian iTunes gift vouchers. Is this possible? Apple doesn’t want you to do this, but it is possible. You’ll need to create a new account on the Australian store, using an Australian mailing address and bank card (credit or debit). You may be able to create an account without a card, or with PayPal, but I can’t say for sure, because I don’t have an Australian address. Click either Change Country or a flag icon in the iTunes Store to enter a different country’s store. You can sign in to and out of either store in iTunes: Look for either the Change Country link or the flag icon at the bottom of any iTunes Store page. On an iOS device, go to Settings > iTunes & App Stores. Tap your Apple ID, then tap Sign Out. Sign in with the other Apple ID, and you’ll get a message that it’s not good for the current store but that you’ll be transferred to the new one. Note that if you change Apple IDs on a device—computer or iOS device—and use automatic downloads, you won’t be able to change the Apple ID on that device for 90 days. So just turn off automatic downloads. Q: My wife and I buy books and films from the same iTunes account and store them on the same computer, but in different user accounts. Can I access my wife’s books and can she access mine to use on each other’s accounts? Yes. The easiest way to do this is to copy items you want to share to your respective Public folders (found in your home folders, the ones with the house icon and your usernames). Each of you can then access the other’s folder. When logged in to your account, choose File > Add to Library in iTunes and navigate to the other’s Public folder. Then select the content to copy the files to your iTunes library. This AppleScript can find all the content in your iTunes library and sort it according to the person who purchased it. Q: My daughter used to share my Mac, buying content with her own iTunes account. She’s gone away to college, and there’s still a lot of her content on my Mac. I’d like to find this and remove it—how can I do this? Download Doug Adams’s Track Down Purchases AppleScript (donation requested). It will sift through your iTunes library and create playlists labeled by name or Apple ID containing content belonging to each account in the library. Find her purchases and then just delete them from your computer. Q: I have two Apple IDs and two accounts, but this is a headache. Can I merge these two accounts into one? Nope. Apple has never allowed it, even though there appear to be a lot of people who would like to do so based on all the questions I get on the subject. It would be so much simpler for, say, a couple that gets married to merge accounts than to have to work with two different Apple IDs. But until Apple changes its policy, you’re stuck.